Unique Event Advertising Brand Spotlight…Order Your Free Sales Kit Today. polyester is guaranteed not to wash, peel or wear off. It doesn’t matter what name you use for Event Marketing Display Logo Covers – Table Covers, Table Throws, Table Drapes, Table Banners, Trade Show Covers, Table Runners, Table Aprons, Table Skirts or others. Aprons Etc. has your client’s on-site event marketing needs covered. 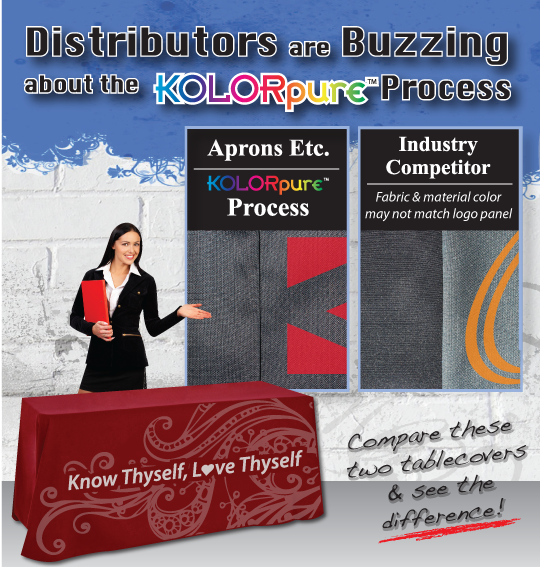 Choose from a complete selection of disposable and fabric table cover styles plus full color large format digital dye-sub and screen printing options to make a Logo Brand Impact!